In a comment on the Kiwi Thinker post yesterday, Bill Illis debunks the warmist's claim that "90% of the 'missing heat' allegedly trapped by greenhouse gases has gone into the oceans. Bill shows the numbers simply do not add up, 86% of the "missing" energy is still missing and has left to space, or is still hiding somewhere outside of the oceans and atmosphere [highly unlikely]. In addition, for multiple physical reasons, IR radiation from greenhouse gases cannot heat the oceans, due to a penetration depth of only a few millionths of one meter, which causes evaporative cooling of the ocean "skin" surface, not warming. Also, decreasing the temperature gradient between the ocean and atmosphere by a doubling of CO2 levels could only warm the oceans by 0.002C at most. And since there has been ~zero warming of the atmosphere for the past 16-26 years, there has been zero change in the ocean-atmosphere temperature gradient over that period. Therefore, we can effectively show no significant anthropogenic warming has gone into the oceans over the past 16-26 years due to no change in the gradient, that the ocean temperature changes have been related to solar (mediated by clouds and other potential amplification mechanisms), and to natural ocean oscillations, but not to increases in man-made CO2. Skeptical Science tells you that 90% of the warming went into the oceans. That is, of the heat remaining in the system, 90% went into the oceans. But they really left out the percentage that has merely been emitted back to space and/or is simply missing. The IPCC says that the net forcing is +2.30 W/m2 right now. On top of that, there should have been water vapor and cloud feedbacks for another +1.75 W/m2. But all that is showing up is 0.535 W/m2. 86% of the energy is no longer here or is missing. 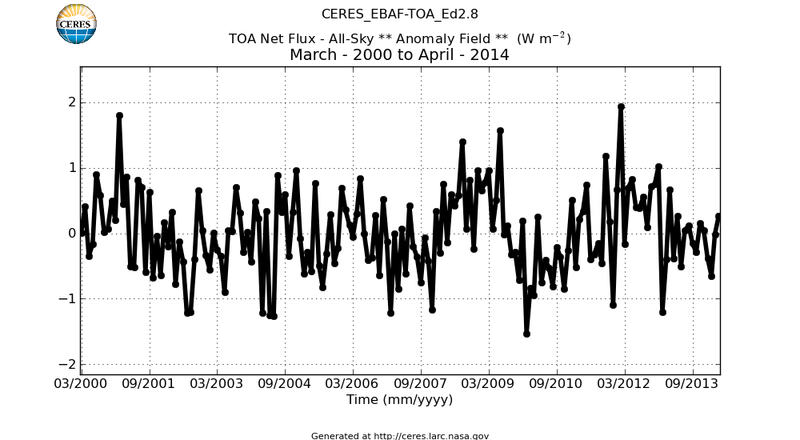 The latest numbers from CERES shows that there is no change in Net Radiation since the year 2000, almost 14 years now. Source: Slide 5 from Norman Loeb, the principal investigator for CERES. Updated CERES numbers to April 2014. "The IPCC says that the net forcing is +2.30 W/m2 right now....But all that is showing up is 0.535 W/m2." My comment: The IPCC cannot be relying on observations to come up with this figure. NASA does rely on observations and 0.5+/-0.43 W/m-2 is what NASA scientists and their colleagues estimated in a paper recently discussed on this blog site. Norman G. Loeb, John M. Lyman, Gregory C. Johnson, Richard Takmeng Wong, Brian J. Soden and Graeme L. Stephens, Observed changes in top-of-the- radiation and upper-ocean heating within uncertainty. Actually even James Hansen, an ultra-warmist, claimed in 2011 that the energy imbalance was only 0.58 +/- 0.15 W m-2 about 0.09% of total flux. These two estimates are substantially the same within the error bars. Calculations: Total flux of 680 Wm-2 is the relevant comparator because the net amount contains errors from 680 Wm-2 the sum of both downward and upward fluxes, each about 1360/4 = 340. The figure 1360 Wm-2 is the solar energy falling on the disk presented to the Sun, itself containing at least 4 errors One arising from the assumption of a sphere; two from the error at the terminator; three, instrumental error; four, use of average values. By contrast, the IPCC estimates the energy imbalance to be about 4 times greater than do NASA scientists. Taking into account that the NASA estimate is the difference between the downward and upward radiative energies, the difference between the NASA and IPCC figures is only about one-third of one per cent (0.3%) of the total energy flux. Now that is not bad when the instrumental and other errors add up to 17 Wm-2, which is 2.5% of the total flux. Dr Spencer’s diffusion model on this web site and used it to check James Hansen’s update of the heat sequestered by the oceans. 1. As latent heat in transforming ice to water and water to water vapor. This does not change the temperature, at least not directly though there are feedbacks. 2. Warming the land and warming the water in and on land in all its phases. The figure may not be very firm, but the estimates give 90% as the portion of heat that must appear in the oceans. And observations state that the heat has not been stored there. Theory says that if the heat is not found in the oceans the heat does not exist. Therefore, the IPCC is wrong in its estimate and NASA;s estimate is closer to being correct. A skeptic like me says, hey hold on a minute. The best NASA can estimate is within 17 Wm-2 and their estimate is 0.6 Wm-2 as the net amount of heating. NASA says that their error is about 28 times as big as their estimate of the heating. I think that they are saying they need more money to improve their estimate. And if that is what NASA is saying, I agree that it would be better not to waste a trillion dollars on climate mitigation when NASA needs only a few billion to tell us whether or not the Earth is really warming or whether our fears are merely inadequate measurement and poor modelling. It would be better to do nothing about climate now and wait to see if NASA can improve their estimate of how climate is changing and if so why. The NASA Glory satellite was intended to directly measure Earth's energy balance, but didn't reach orbit in 2011 and as far as I know, there aren't any plans to launch a similar satellite. I've spoken to several JPL scientists and not found much interest in pursuing anything that might upset the CAGW dogma, unfortunately.